Our goal is to connect people with the best local experts. We scored tree service professionals on more than 25 variables across five categories, and analysed the results to give you a hand-picked list of the best tree service professionals in Winston Salem, NC. Bobby's Tree Service, Inc. has been offering tree care services in Clemmons for over 40 years. The licensed and insured business can remove oversized trees without harming lawns and also handles selective tree pruning and stump grinding as well. Clients can also request grounds maintenance, lighting, irrigation, landscaping, drainage, and consulting services. Bobby's Tree Service is a member of the Landscape and Grounds Management Association, provides written estimates, and has won an Angie's List Super Service Award from 2009 to 2013. Senior discounts are available. Canopy Tree Service handles tree service in Mocksville. The fully insured group specializes in precision felling and hazardous tree removals and is known for removing trees quickly, safely, and at an affordable price. Additional services include tree topping and trimming, tree aerating, lot clearing, and storm damage cleanups, and firewood is also available. Canopy Tree Service boasts years of experience and is equipped with various specialized equipment including pull ropes, dump trucks, brush chippers, skid steers, stump grinders, and chainsaws for any job, large or small. Carmichael's Tree Service brings over 45 years of combined experience in tree care to Lewisville clients. The locally-owned group employs two ISA Certified Arborists and is known for timely and tidy tree care. Services include tree removal, pruning, stump grinding, crown cleaning, tree risk assessment, trunk cavity detection, vertical mulching for compacted soils, and feral bee retrieval. Bobcat and bucket-truck services are also available, and the company caters to both residential and commercial clients who have appreciated the group's reliable estimates, fair prices, and knowledgeable staff. Carolina Stump & Tree Service Inc. has been a tree service in the Stokesdale area for over 35 years. The family-owned and operated business is licensed, bonded, and insured, and the group's professional services cover tree removal, tree trimming and pruning, stump removal, and storm damage cleanup. Customers can rely on the team for 24-hour emergency tree service when required, firewood is also available, and interested parties can request to see certificates of insurance as well. Past clients have appreciated the team's fast and efficient work, friendly service, and reasonable prices. D.W. Tree Care is a Winston-Salem tree care company with over 25 years of practice in the field. The fully insured team has a reputation for clean, safe, and professional work with services for tree planting, tree removal, pruning and limb removal, stump grinding, and disaster response and storm cleanups. Crews can also clear wooded lots as well as overgrown areas, deliver firewood and uncomposted mulch, and handle landscaping work including light grading, bed preparation, planting, and shrub pruning and shaping. Frady Tree Care brings over 20 years of experience in tree care to Lexington clients. Residential, commercial, and municipal customers hire the team for various tree services including removal, pruning, health services, fertilization, insect and disease control, and stump removal, and appraisals, as well as consultations, are also available. The group employs ISA Certified Arborists, has received Angie's List Super Service Award three times, and holds an A+ rating with the Better Business Bureau. Frady Tree Care's parent company is HRF Enterprises, LLC. Goodson Tree Service is a Winston-Salem tree service with almost 35 years of practice in the field. Services include tree removal, dead wooding, pruning, trimming, selective tree and shrub pruning, chipping, storm cleanup, stump removal, and undergrowth removal as well. Emergency services are also available, and the team is made up of experienced climbers. Goodson Tree Service provides all equipment required, offers affordable prices, and also holds an A+ rating with the Better Business Bureau. Pegram Tree Service is a Greensboro tree service company backed by 25 years of experience. The OSHA-compliant crew offers tree removal, tree health and maintenance, and snow removal, and the owner is present for every job. The group is known for competitive prices as well and features top-notch equipment, including heavy-duty cranes, dump trucks, wood chippers, stump grinders, bucket trucks, and bobcats. Pegram Tree Service holds an A+ rating with the BBB, and a cat rescue service from trees is also available free of charge. R & J Tree Service takes care of trees for clients throughout Pilot Mountain. The locally-owned and operated tree service employs landscape experts who can handle difficult tree removals, emergency damage control, tree pruning and shaping, trimming and shrub removal, stump grinding and removal, tree fertilization, and tree diagnostics as well. General landscaping is also available with services such as tree, shrub, and flower planting and installations of woodchips, sod, mulch, and stone. 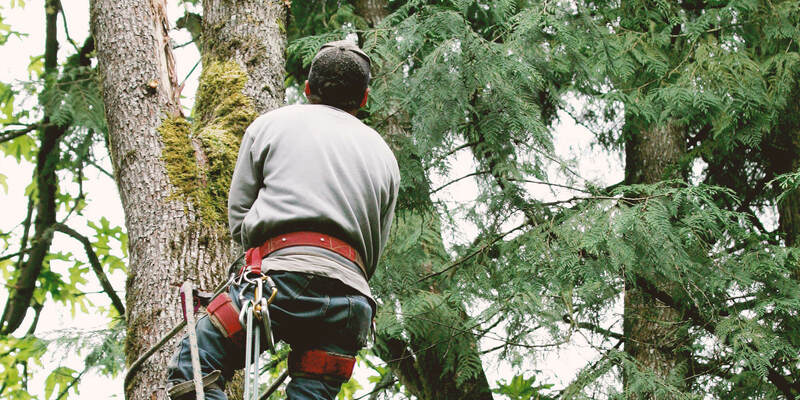 R & J Tree Service is insured and follows safety guidelines in all its work as well. Renaissance Tree Care, Inc. brings a lifetime of tree care experience to the Lewisville area. The owner's family has been in tree services for four generations and his grandfather was known as “a pioneer in soil conservation and modern farming methods.” The fully insured group uses a holistic approach in all of its work, and services include pruning to clean, pruning to thin, pruning to elevate and lift, pruning to reduce, structural pruning, and pruning to restore. Tree and stump removal is also available including with cranes, and safety is always a top priority. Tommy's Stump Removal & Tree Service has been servicing trees in East Bend since 1975. The locally-owned and operated business is fully insured and handles both large and small tree projects including the removal of large and hazardous trees, stump removal, tree trimming, pruning, dead wooding, and chipping. The company has grown over the years via referrals from happy clients, is known for providing timely, safe services and leaving properties in tip-top shape, and will provide references along with certificates of insurance upon request. Trim Pro Tree Service has been serving the High Point community with tree care for over 25 years. The crew can assess a client's property, inform them of what trees can legally be removed or trimmed per local laws and regulations, and prepare a report to apply for a tree removal. The group also has the experience and required equipment to safely remove trees, and the owner speaks to all potential clients himself. Trim Pro Tree Service is insured and bonded and offers 24-hour emergency services as well. Warlick Tree Service handles tree care in Lewisville and is backed by almost 25 years of experience. The group is known for friendly, straightforward service and provides a full menu of tree care including hazardous tree removal, storm cleanup, grading and clearing, tree and shrub diagnosis, selective pruning, tree and stump removal, tree cutting and trimming, and bucket and crane work. Warlick Tree Service is fully insured and a member of the Tree Care Industry Association, and the owner is an ISA Certified Arborist as well.